Bring a little sunshine into your life…both literally and figuratively with Supple Sunshine Solar from our friends at SanRe! SanRe is a small family owned and operated company that uses only ingredients from USDA Certified Organic farmers and producers, hand making their products in small batches with limited heating. When you step outside be sure to apply Supple Sunshine Solar to ensure your skin is properly defended from those harmful rays of the sun. Thanks to the zinc oxide and titanium dioxide, super mineral, broad spectrum ingredients, your skin will be protected against both UVA and UVB radiation. This pale, lemon yellow pot of sunshine is loaded with quite a list of organic ingredients like safflower oil and aloe vera gel to soothe and moisturize your skin; grape seed oil, a powerful antioxidant rich in vitamin C; coconut oil to fade scars and other skin discolorations; and a variety of essential oils that in addition to giving it a fresh scent, also lend their anti-bacterial, antiseptic, and anti-inflammatory powers. The creamy texture is absorbed fully, leaving your skin moisturized and nourished without any hint of chalky whiteness or stickiness. 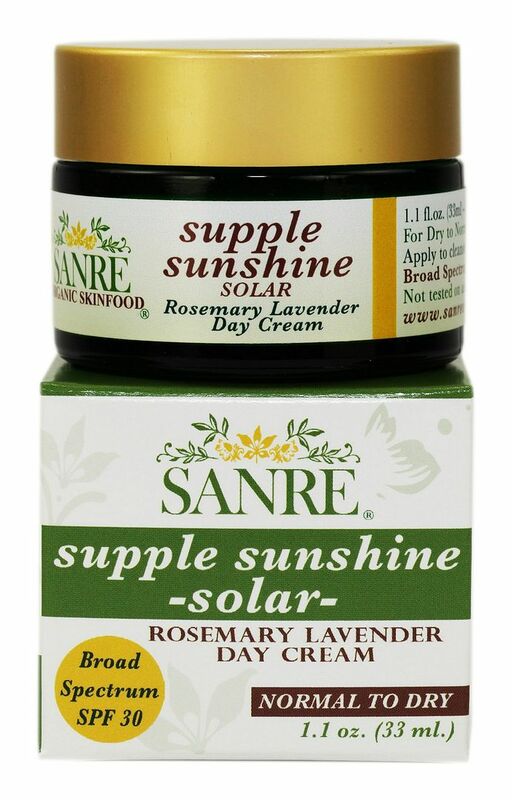 Feed your skin with only the best, wholesome organic ingredients with SanRe Supple Sunshine Solar!